The original OHP specification was intended to define a simple but comprehensive ASCII protocol to deal with hypertext objects. However, this was too broad an issue to be addressed by a single protocol. Therefore, we have focused on navigational hypertext and produced a specification that is more powerful within this more specific domain. 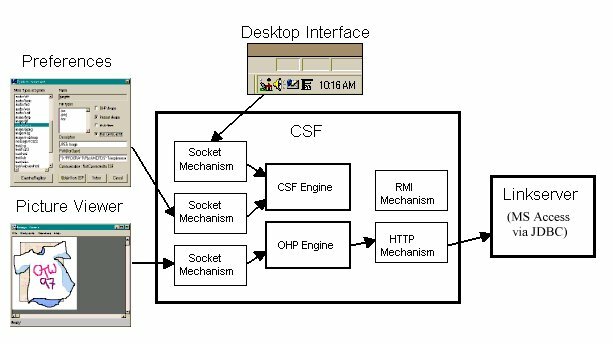 This paper describes the design of OHP-Nav, defined both in IDL as an interface and in XML as a tagged ASCII protocol. We believe that this reworked definition can form a basis for focusing on the real issues of interoperability in open hypermedia systems. Millard, David, Reich, Siegfried and Davis, Hugh (1998) Reworking OHP: the road to OHP-Nav. 4th Workshop on Open Hypermedia Systems, ACM Hypertext '98 Conference,, Pittsburgh, United States. 20 - 24 Jun 1998. pp. 48-53 .